A member of the global stuttering community from Australia reached out to me and asked if I would read his new book. I was delighted, as I always enjoy reading about stuttering. 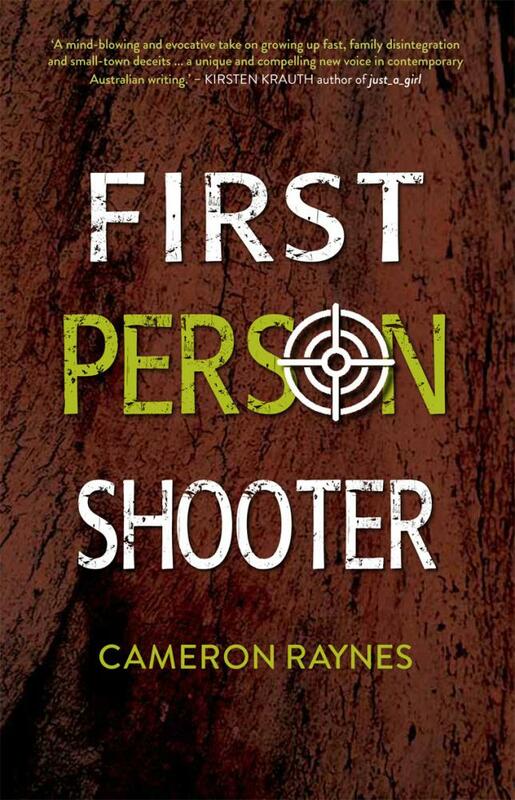 I recently read “First Person Shooter,” written by Cameron Raynes, a person who stutters. The book is a young adult novel, with some adult themes. The book is narrated by young Jayden, a 15 year old boy who stutters. Jayden is addicted to video games and has a crush on his best friend Shannon. The story is pretty intense, loaded with characters who all have their own story. Jayden and his father are surviving after losing his mother 12 years earlier. Shannon’s mother is due to be released from prison. Jayden is constantly trying to outrun a couple of school bullies. He has a part-time job at a meat shop and looks in on his neighbor, a disabled veteran. The town is bracing for violence from Pete, who is looking to exact revenge for the murder of his father. And Jayden’s beloved dog is dying. There is a great deal I could focus on in this gritty coming of age story. For the purposes of this blog, I’ll focus primarily on the stuttering. Stuttering is not always portrayed well in the media and the arts, so I was eager to see how the author incorporated it into the story. The first thing I’ll say is the stuttering experience is beautifully handled. It is obvious that the writer has first hand experience with stuttering. He nails Jayden’s struggle with having much to say, but feeling unable to express himself the way he wants. Jayden has a love of poetry but can’t make his own words flow. Jayden shares many real and poignant feelings about his stuttering, which at 15, he realizes will be with him for life. Early on, he reflects that “to speak is to be human,” inferring that perhaps he doesn’t always feel human because of the way he talks. When he speaks, his words are ugly. He escapes these feelings by getting lost in his video games. Jayden also describes the dread of sitting in class and having the teacher go around the room and know that he is not going to be able to get out of speaking. He speaks of scanning ahead, which is a trick that many people who stutter use to avoid stuttering. In class, he has also tried being funny, to draw attention away from his stuttering, which doesn’t always work. Jayden has a circle of friends who accept him. Several of them have also been picked on by the school bullies, so they are a small group with commonalities. Jayden appreciates his friends because he can be himself and not be consumed by the constant worry of how he will sound and how they will react. Throughout the story, Jayden dreads an oral poetry presentation he must do before the end of the school year. Anyone who stutters can empathize with Jayden’s terror of having to speak and stutter for a prolonged period of time. It can be a harrowing experience for an adult, and this is an adolescent dealing with the cruelty of teens. Jayden gets through the experience and closes the door on another school year. I highly recommend this book for teens or adults who stutter and anyone for that matter. It is well written, with an honest, believable character who stutters. The author lets us into Jayden’s head and we get how tough stuttering can be. Most fluent people don’t really “get” stuttering. Raynes masterfully weaves Jayden’s stuttering into a story that is dramatic, intense and satisfying. You feel for the kid and applaud his tenacity and courage on many fronts. You’ll have to read it yourself to know what I mean. And I hope you do. I just finished the excellent book Paperboy by Vince Vawter and couldn’t stop smiling. Paperboy is the story of an 11-year-old boy who takes over his best friend’s paper route for a month during July in Memphis. Victor is happy to help his friend out, but secretly obsesses over having to communicate with customers when he collects the weekly fee. Young Victor stutters and the author perfectly captures the feelings, fears and worries that come with being different. We are able to get right into Victor’s head as he practices speaking to some of his customers and as he fervently switches trouble words for words he can say without stuttering. The author uses a unique style to depict dialogue throughout the story and conveys through words what Victor’s stuttered speech sounds and feels like. This story will resonate with young people and adults who stutter, as it depicts a real life situation that all of us who stutter can relate to. Victor uses some speech therapy techniques to make his stuttering easier, and he also uses avoidance, which will be all too familiar to many of us who try to be covert! Paperboy is the story of a kid who is a great baseball pitcher, a friend and a youngster who is learning how to communicate with adults, stand up for himself and learning about empathy. We learn about his relationships with his parents, his Mam, his peers and the adults he encounters on his paper route. And we root for him as he finds himself in some tough situations and as he gradually becomes more self-aware. This is a great book about stuttering, life and coming of age. It’s geared for young people, but adults (including parents of kids who of stutter) will love it too. Put it on your reading list. You won’t be sorry!